It’s been a long while since I’ve seen the movie My Big Fat Greek Wedding. I’ve known few people who haven’t loved that movie upon seeing it, and especially appreciated the hilarity contained within the story of Toula, along with her immediate and extended family, the Portokalos. The fact that the movie is based on a Greek family is in some ways incidental for it could really be any nationality, in that lots of families on this earth could pick something within their own culture or familial natures from the movies characters and lines that fit precisely to their own clan. For my own family I would probably best describe the lines from the movie as “My family is big and loud but they are my family. We fight and we laugh and yes, we roast lamb on a spit in the front yard. And wherever I go, whatever I do they will always be there.” Well, we don’t really roast lamb on a spit in the front yard, but when we do get together we have been known to enjoy lots of good food over the shared table. Whenever we have family reunions there is general sort of a go with the flow, everyone always having a lot of fun, and, occasionally, rarely, OK, occasionally, on some intermittent occasions there might be some just higher than normal voice decibel disagreements which essentially get brushed off, well, pretty quickly, like kids arguing over whose turn it is to play with the ball. Then it’s over. Done and forgiven. Everyone is playing with the ball and that’s just the way we roll, always have. 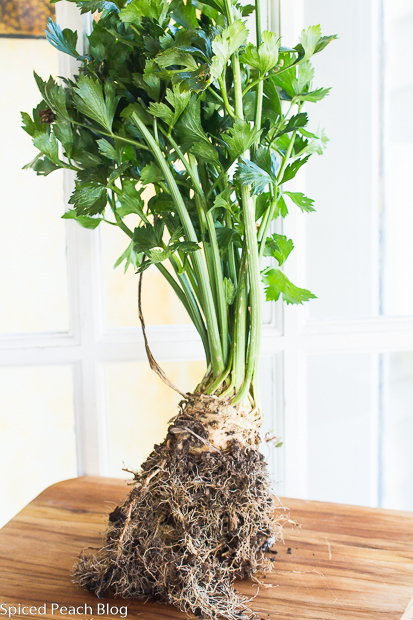 I guess you could say this standard has kind of given us our own good roots over the years even in difficult times. We don’t formally plan a whole lot of things beforehand when we get together either, but the one thing always happening on the first night whenever any of my siblings comes for a visit is that I prepare a major feast, and the eating and chatting goes on for hours. 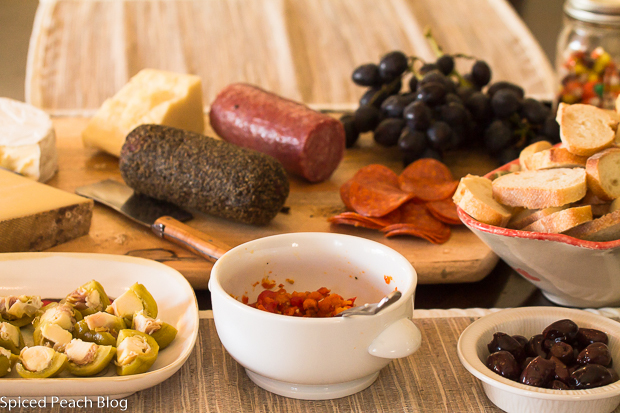 Beginning with an antipasti, set across the span of the table, there are salami’s and other assorted meats, along with a combination of soft and hard cheeses, olives, pepper shooters, artichokes, fresh roasted peppers, breads and crackers, pretty much enough to make a meal in itself. Then we move on to the soup, salad, and main, and, well, I told you the feast goes on for hours. Last week before the arrival of one of the siblings, my sister Carolyn, and her husband Roger from Las Vegas, the soup course involved celeriac, shown above, pulled out of the backyard garden for a celeriac and fennel soup, thick and hearty, a small cup for each lent the distinctively scented celery flavor just enough warmth and comfort appreciated in the season’s first days of chill. Gathering ingredients beforehand, I spotted a gorgeous case of Pears at Costco inspiring the finishing touch for our first evening get together, Poached Pears in a red wine sauce. My grandson, the J-Dude frequently eager to help out in the kitchen peeled the pears, sort of giving the fruit an added sort of geometric design, but hey, at least he is learning. Pears peeled and readied just before arrival, it all of the sudden occurred to me that it had been quite a while since I’ve prepared poached pears and had this nagging feeling that I was leaving out some ingredient. 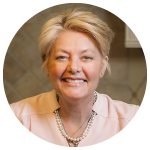 Fortunately, I recalled one of my favorite cookbooks of the year, “A Kitchen in France, A Year of Cooking in My Farmhouse” and that the author, Mimi Thorrison, had some sort of similar recipe. Quickly I indexed the pages and voila, Pears A LA Medocaine (with the accent marks, which I incidentally do not know how to insert, my apologies.) Especially nice was that if I had recalled my former preparations going years back, I might have only included a vanilla bean and cinnamon stick but author, Mimi Thorisson, also includes bay leaf and star anise adding a whole new flavor dimension in the finale. Peel the pears leaving the stem intact. 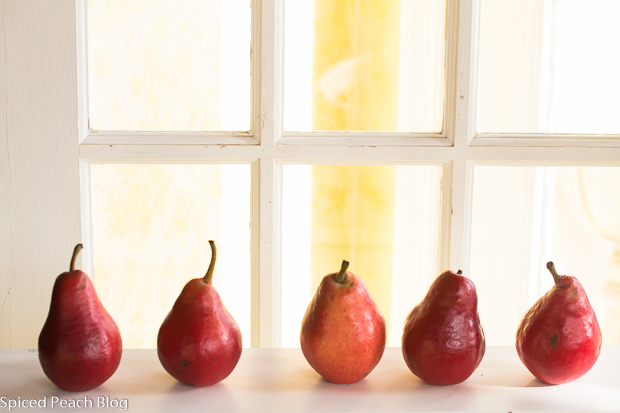 Use a pan wide enough to hold pears upright. Into the pot add the wine, sugar, vanilla bean and its seeds, cinnamon, bay leaves and star anise, stir. Bring liquid to a low boil over medium heat, stirring intermittently to dissolve the sugar. Turn off heat. Arrange the pears stem side up, cover, turn heat back on to medium low, and simmer for thirty minutes, turning the pears over to coat all sides after fifteen minutes. 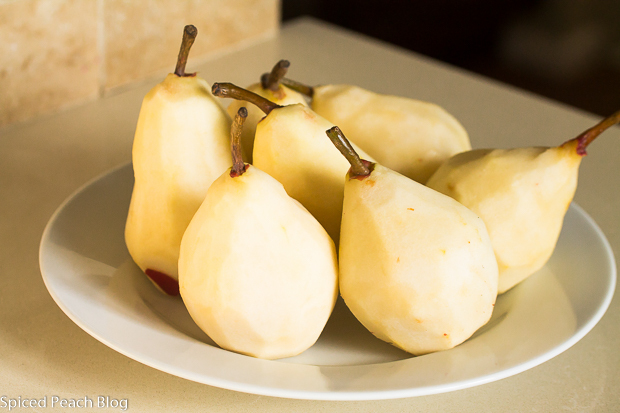 Let pears cool then transfer the pears and the liquid to a covered glass container and refrigerate. When ready to serve, ladle some of the liquid onto the plate and set pear in the center, garnish with fresh mint if desired. Adapted from " A Kitchen in France, A Year of Cooking in My Farmhouse"
This entry was posted in Sweet Treats and tagged Pears Poached in Red Wine, Poached Pears, Poached Pears in Red Wine served in the cooking juices. Bookmark the permalink. Post a comment or leave a trackback: Trackback URL. I love this, Peggy! “We fight and we laugh. And wherever I go, whatever I do, they will always be there.” That is the essence of family. I would add, “and we love.” to the first sentence, but isn’t that the truth. No family is perfect, but every family has some perfect moments and memories that last a lifetime. Great job on the pears, J-Dude! Keep cooking! Hi Kelly, thanks so much! It is so true with families! We have so many laughs and good times whenever my family are together, and not so much fighting, but we tend to always keep things real. As my mom would always say when we are children: ‘clear the air’ and then forgive and forget, and really we are so lucky on that front, its perhaps a grace. 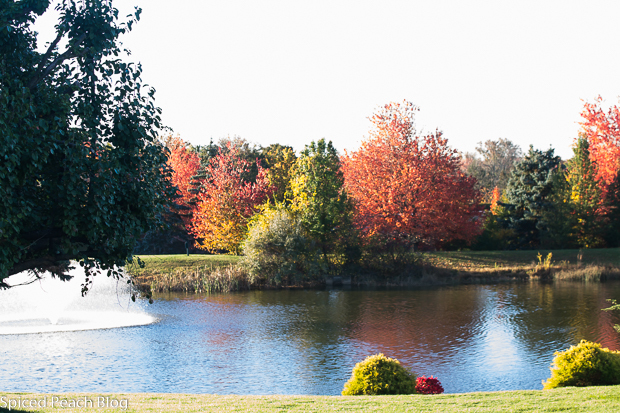 Hope all is well and I’m very much enjoying your diverse fall posting selections! Always great to see you! What an entry, Peggy. Love the sentiment and artfully plated dish. 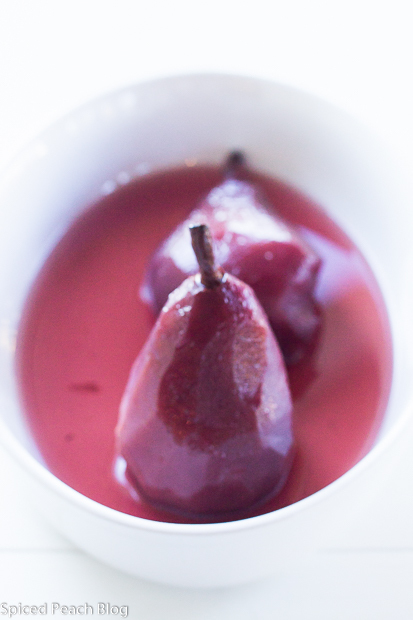 Thank you Jolma, and the poached pears are quite delicious. I’ve very much appreciated and enjoyed your Tibetan Dumplings story and ways that you have championed literacy through the Tibetan dumplings, tied along with the sentiments of friendship towards your English tutor from over the years, and your ultimate achievements! See you soon. 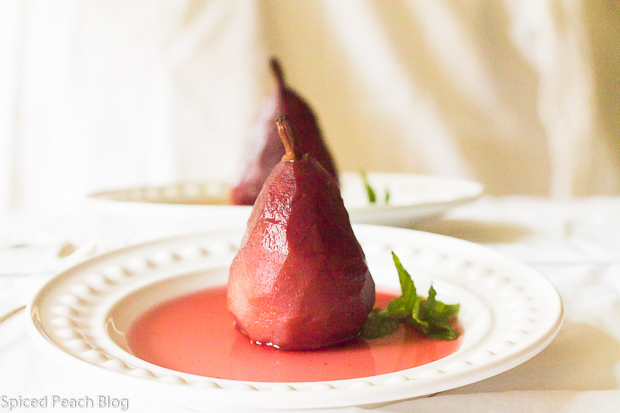 Yum, poached pears. I am actually a fan of that movie and they are finally making a sequel! Phil recently posted…Cupid’s Undie Run – running in my undies for a good cause! 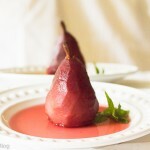 Hi Phil, thanks much Phil, poached pears are so very delicious, I love them on top of creme anglaise too. Thanks for updating me on the movie, I didn’t know they were making a sequel, I hope its as funny as the first!